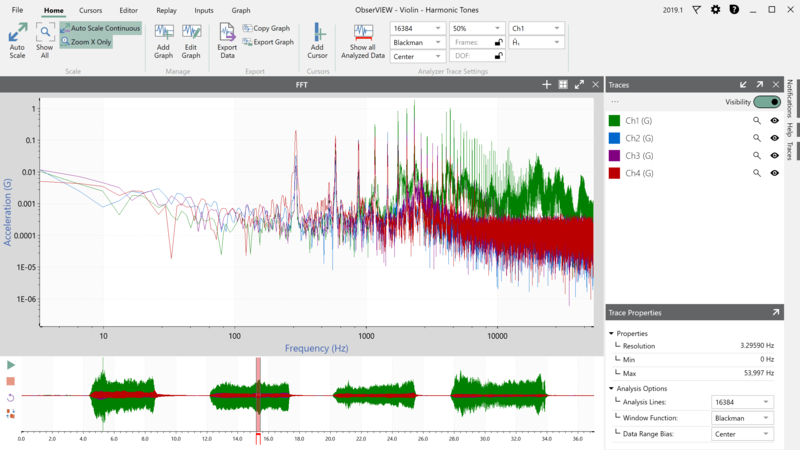 Use ObserVIEW software to view, edit, and analyze time waveform recordings from the VR9500 or ObserVR1000 hardware. 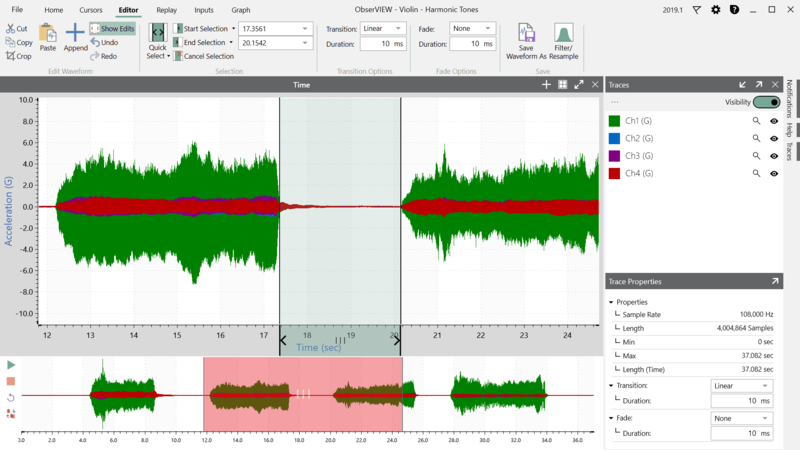 Time waveform editor and basic analysis are free for all users. Download ObserVIEW for FREE and try it out! With ObserVIEW’s powerful Editing functions, users can quickly focus on areas of interest in any data file, then crop, copy, cut, and paste sections, as well as append together multiple compatible files. Advanced functions include user choice of the cross-fade method when connecting two sections of data; choose between taper, linear, and constant power options. Export edited time waveform for use in Field Data Replication (FDR). Coherence is an indication of how closely a pair of signals x and y are statistically related. That is, it is an indication of how closely x “coheres” or “sticks to” y—how much influence events at x and events at y have on each other. 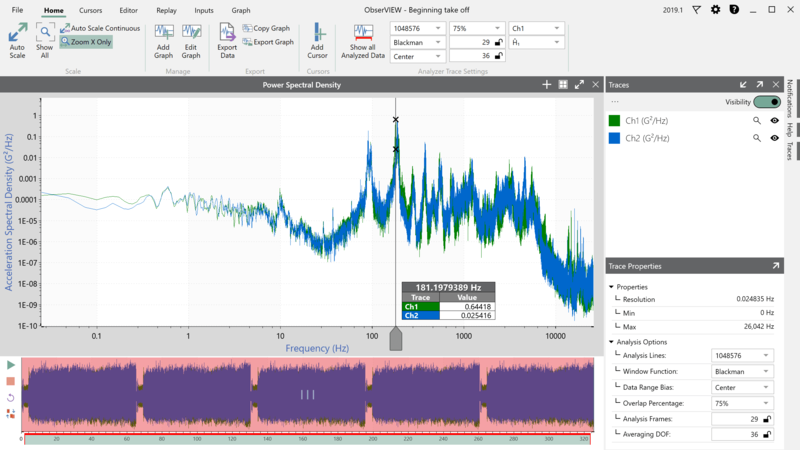 The Cross Spectrum plot shows how much power is in a given band in the frequency domain of a pair of signals that have been multiplied in the frequency domain. Power Spectral Density (PSD) analysis is optimized for efficient analysis of recorded data. 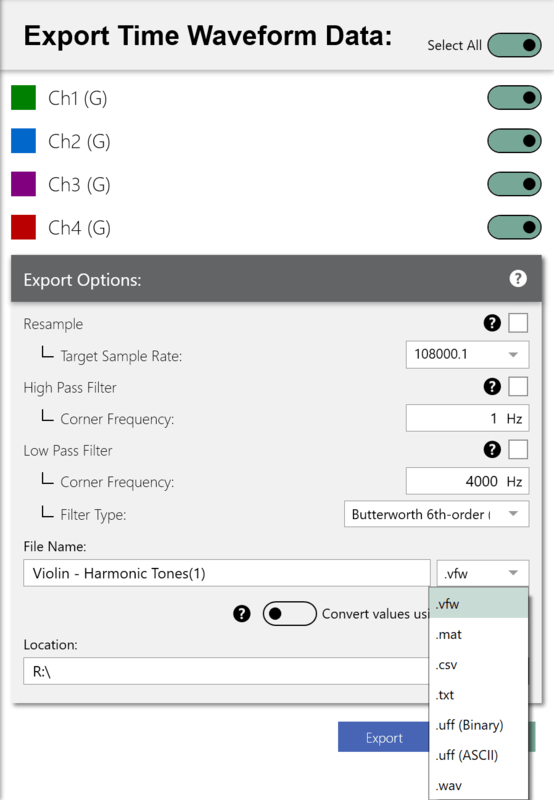 Any setting change causes a fast, automatic recalculation of computed parameters, while users have the flexibility to select automatic or fixed values for frame count and DOF level (Export to breakpoint table in VibrationVIEW to generate Random test profiles). Transmissibility may be used to find a resonance or an anti-resonance in a system. That is, it shows around what frequencies (if any) there is a sudden increase (resonance) or decrease (antiresonance) in the spectral power through a device or system. The Transfer Function of two signals x and y is the relationship between the spectral (frequency) power in x and the spectral power in y. In this sense it is similar to the transmissibility function. However, unlike the transmissibility function, the transfer functions are a complex-value and there are several choices of transfer functions (e.g. H1, H2, Hs, Hv, not just one as in transmissibility). Fast Fourier Transform (FFT) Analaysis computation parameters are controlled by the user, with up to 1 million lines of resolution available when needed and multiple windowing function choices, all selectable from drop-down menus. A unique feature offers a simple graphical interface for defining the data range used in an analysis calculation; we call it ‘data range bias’. 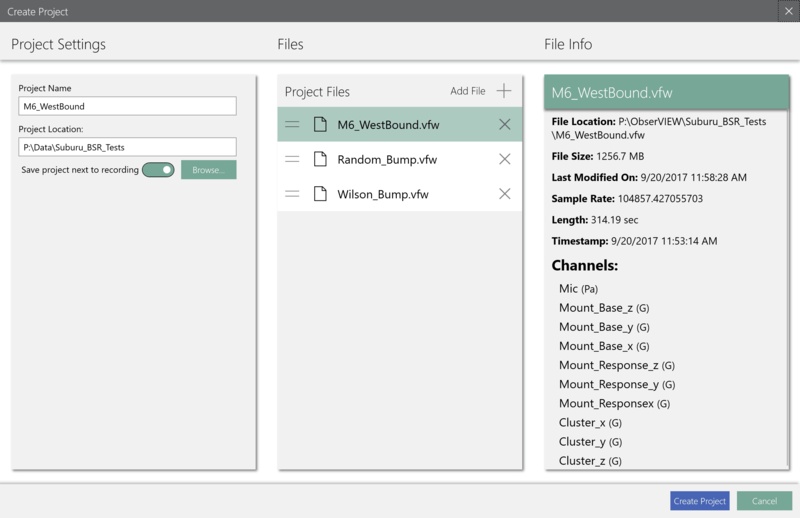 To streamline workflow, users can Combine Multiple Files into one project by first creating a New Project and then adding all desired data files to the project. Both data and related analysis files can be saved together for later review or sharing with colleagues. Effective field testing requires flexibility as well as accuracy. 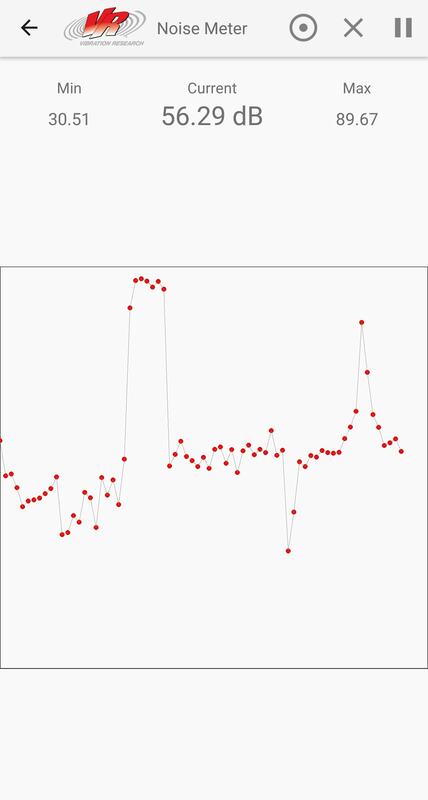 With the ObserVR1000 and the VR Mobile app, you can make changes in the field to any configuration parameter, from sample rate to time zone. You can even format an SD card. 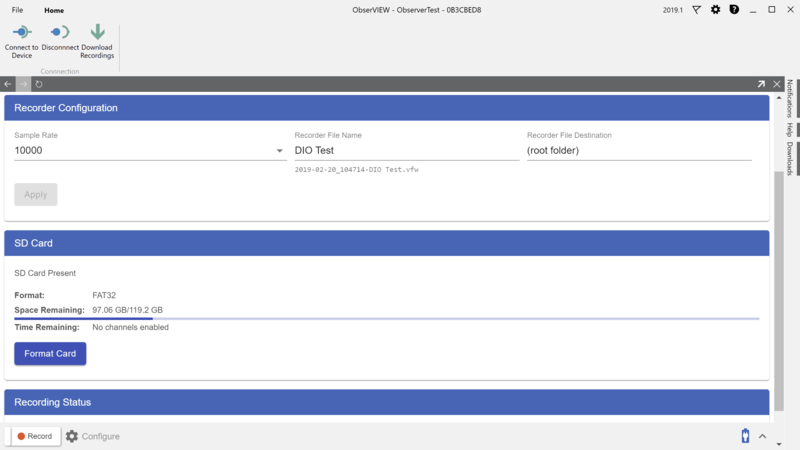 Save time and avoid errors when you set up a field test configuration. 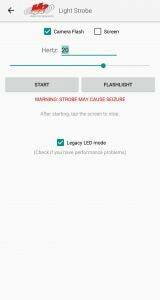 The VR Mobile app automatically updates channel configurations for all powered on and connected TEDS transducers. Conforming to ISO 9001 and QS 9000 is a whole lot easier. 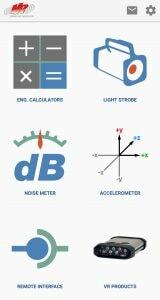 VR Mobile is a tool for vibration test and measurement professionals. It contains engineering calculators, a light strobe, a noise SPL meter, and accelerometer. All of this from your mobile device!